This WTF Wednesday I feel incredibly snarky and judgmental and it’s meant to be humorous. I am not a fashion goddess, considering most of my clothes come from Target and Marshalls, but on the other hand I’m allowed an opinion. 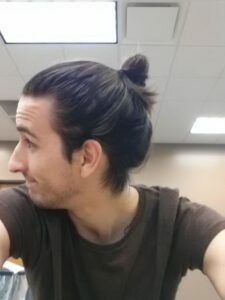 What started this post was when I spent a week in San Diego this summer and saw many men with the messy man bun, women too for that matter. I believe Man Buns are like skirts, he has to be really masculine to pull the look off, otherwise it looks ridiculous. Man buns are the same. Yes, I like long hair on some men, and I guess that’s the first part. 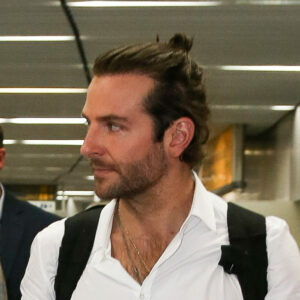 If the guy looks good with long hair, chances are he’ll look good with a man bun. The bandana works and keeps hair out of his eyes. Glamour do. If you can see past his body, yes, Joe rocks a man bun. 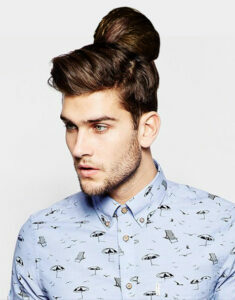 He’s wearing a FAKE bun! No, absolutely not. Nope. A ponytail would have been better or a bandana. 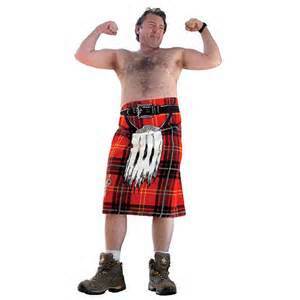 Like beards, kilts, and tattoos some men can make it work and other men can’t. When they can’t it’s awkward, so very awkward. Follow me on Pinterest (Doyle MacBrayne) for more pictures of Man Buns and Man Candy.